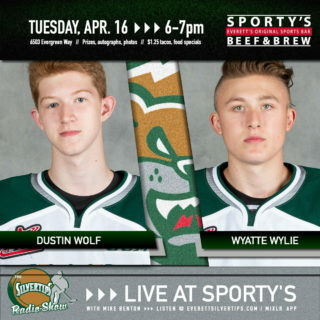 EVERETT, Wash. – A two-goal night from Everett Silvertip captain and Wild prospect Connor Dewar along with a 17-save effort from goaltender Dustin Wolf helped lift the Everett Silvertips over the Kelowna Rockets to victory, 2-1, before 6,125 fans at A.O.T.W. Arena on Saturday night in WHL action. 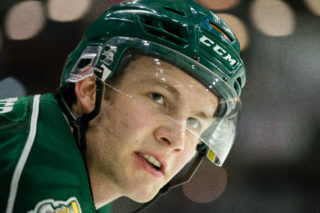 Dewar scored the game-winning goal with 53 seconds left in regulation with a roaring wrist shot from the slot, as the Silvertips extend to 8-2-1-0 in the last 11 games and snap the Rockets three-game win streak. UP NEXT: The Western Conference-leading Silvertips hit the road to play the Portland Winterhawks tomorrow, Nov. 25, at the Veterans Memorial Coliseum at 5:00 p.m. (1380 AM / 95.3 FM / Tips App / WHL Live). In a scoreless first, the Silvertips came out red-hot as they landed 10 shots on net before the Rockets recorded their first shot. Both teams came up short on converting their respective power play opportunities. Everett finished the opening period with 16 shots on goal, as the Rockets’ recorded five. 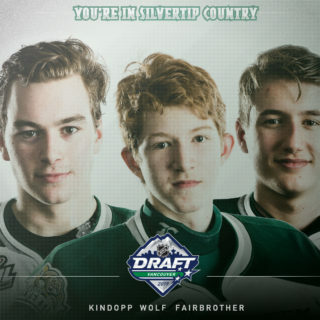 Dustin Wolf turned in an impressive save on Nolan Foote, then the Tips turned the puck up the ice and James Porter stopped Reece Vitelli’s one-timed blast off the rush. In the second, Dewar put the Silvertips up 1-0 at 6:43 with a quick one-timed blast past Porter’s glove. 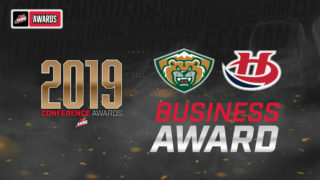 Everett defenseman Savhan Khaira played the puck up along the near boards to near forward Akash Bains, where Bains delivered a backhand centering pass to a wide-open Dewar between the circles. The Silvertips finished the second period with 23 total shots on net, compared to the Rockets 11. In the final period, Rockets forward Kyle Topping tied the game, 1-1, at 8:37. Topping fed forward Liam Kindree with a give-and-go pass to set up a Rockets’ goal. With 53 seconds left in regulation, Dewar captured the Silvertips go-ahead goal with a wrister from the slot, after he dangled around a Rocket’s defenseman, creating an open look. Everett forward Bryce Kindopp dropped the puck back to Dewar along the boards off a feed from Wyatte Wylie. Porter finished the game with 40 saves. 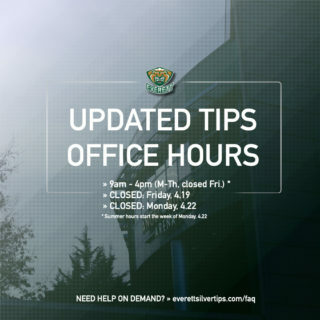 NOTES: Silvertips scratches include Ian Walker, Jalen Price and Bronson Sharp … Rockets scratches include Cayde Augustine, Ted Brennan, Michael Farren and Kyle Pow … The Silvertips are 28-22-12 in the all-time series against the Rockets … The Silvertips have won six consecutive meetings and are 10-0-2-1 against Kelowna in the last four years … Everett is 8-2-1-0 in the last 11 games … Everett snaps Kelowna’s three-game winning streak.